I find this the most interesting time of the year as right now is an indicator as what the summer fishing is shaping up to be. As I have said many times, I have had a great concern as to the state of the inner gulf fishery, but it is so pleasing to see such a reversal it bodes well for the future if we all take care of it. As good as the fishing gets there is no solid reason to take a limit of fish if you can't use it straight away. Too often I hear people dragging their knuckles on the ground, pounding their chests, boasting they got a limit bag having been out and done the same the day before. Remember that the snapper don't drop all their spawn in one go, they release it on two or three shots over a couple of months in case there is a sudden drop of water temperature or a storm goes through the area. As all snapper are born on the surface as females and remain there for around fifty four days till the smart ones change into males and they all head for the bottom. One of the issues we all face is the number of undersize snapper that are just like kids and don't stop eating, hence a lot are hooked and released. However, if they are not handled well the mortality rate is massive even though they appeared to swim away strongly. What we all want is a better hook up rate and you can achieve this and also minimise the number of small fish hooked by going up in hook size to at least a 7/0, or 8/0 even, so you will still hook small fish but with a bigger hook it is a lot easier and less stressful removing it from the fish. As I have been saying for the last month, there has been a lot more snapper come into the inner Gulf via the Rangitoto, Rakino and Motuihe channels and they are now starting to spread out on the flat sand. Having seen the changes over the last few weeks and what with the weather and moon phase, I have made alterations from my normal course - there is no point in running the normal straight line from A-B as you don't learn anything new. Having the advantage of a Furuno TZ touch sounder plotter I can see the size of any fish that pass directly through the middle of the transducer as well as the normal marks from fish either side of it. On very flat sand and with the snapper spread out you mainly see small blotches or individual targets. Small marks are bloody hard to tell the size of the fish, and it is simply the fact the Furuno TZ touch has been showing a number of snapper around 42-56 cm spread around that I have slowed down and spent a bit of time sounding around on the sand. The area I have found holding a lot of fish is on the inside of Rangitoto from the wharf down to Islington Bay in 8-12 meters. What you have to bear in mind when in this depth is that the footprint (the actual size of the area on the bottom showing on the screen) is quite small, so you do need to put a bit of time and effort into getting an overall idea in your head as to how many fish are in the area and where and why they are there. During the week when there is less boat traffic is when I tend to target this area. Before settling in, I steam around to get a good overall idea of where the snapper are. Then, taking into consideration the wind and tide, a set the boat up for a drift fish as I find that dragging a bait past a fish is far more effective than anchoring and waiting for the fish to come up the burly trail. When it comes to the weekend when every man and his dog are out on the water charging about, if the wind and tide are going in the same direction I head out onto the worm beds and do the same thing. I spend time looking and building up a picture but once I know what I want to know I drop the anchor. The reason for dropping the anchor (unless it is a windless day, then I drift) is that I can then catch fresh bait more easily and big baits always catch the bigger fish. As you can't always get away from small snapper, it takes them a lot longer to destroy a big solid fresh bait, and all the commotion they make ripping a bait apart draws in the bigger fish to see what's going on. 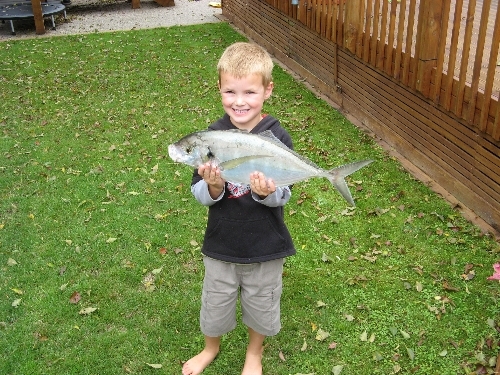 Fishing both on the drift or at anchor is done with a very simple stray line rig with no trace and just an 8/0 hook and a few small 1/8th or ¼ sinkers above the hook when drifting or fishing at anchor the less weight, the better. My pick for the weekend, depending on the weather, would be out on the worm beds or have a wee sneaky look on the western side of Motuhoropapa Island – look at the contour lines and then zig zag don the face of the drop off from the top of the island to around halfway down it, by the way have a look around the Hay Stack on your way there.